Stay in one of 33 guestrooms featuring flat-screen televisions. Complimentary wireless Internet access keeps you connected, and satellite programming is available for your entertainment. Private bathrooms with showers feature complimentary toiletries and hair dryers. Conveniences include desks and coffee/tea makers, and housekeeping is provided daily. This hotel has modern interiors and an indoor pool. It is located in a quiet area, 1 km from the centre of Szklarska Poreba. Guests can relax in the spa with sauna and hot tub, and use a wide range of beauty treatments and massages. There is an elegant restaurant serving Polish and European cuisine. The hotel is close to hiking trails, ski slopes, numerous bike trails and cross country skiing paths. 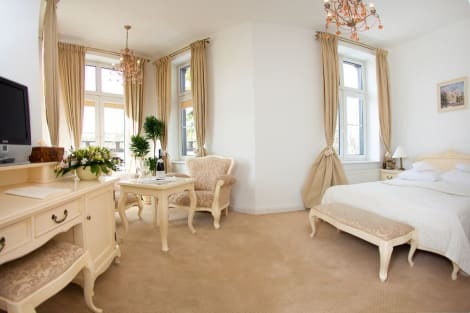 This lovely hotel is set in Szklarska Poreba. The hotel comprises a total of 117 snug accommodation units. Pets are not permitted on the premises. The Resort is located in a quiet area, at 1,5 km from the center of Szklarska Poręba and at 2,7 ​​km from the train station Średnia. The Dinopark is also within easy reach which makes the hotel also perfect for families with children, as well as couples on a romantic escapade. The hotel features modern and spacious apartments with a seating area and a fully-equipped kitchenette so guests can enjoy their stay with total independence. Most of the resort's apartments boast outstanding views of the Szrenica Mountain. lastminute.com has a fantastic range of hotels in Szklarska Poreba, with everything from cheap hotels to luxurious five star accommodation available. We like to live up to our last minute name so remember you can book any one of our excellent Szklarska Poreba hotels up until midnight and stay the same night.